Welcome to the Magical Blogorail! 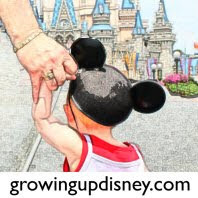 We are a group of bloggers who have come together to share our love of Disney. Each month we will bring you a new loop and each new loop will have its own theme. This time we will be sharing with you how we celebrate the holidays Disney-style. As you follow us through this month's loop, you will find at the end of each post a link to your next stop. Feel free to follow our blogs, add your own comments and share our blogs with your friends. This is a great opportunity to learn about Disney topics from the perspective of several different bloggers. Thanks for joining us and enjoy the ride on our Magical Blogorail! I love to include touches of Disney in my home all year long and Christmas is no exception. As a matter of fact, my Disney fascination is probably more obvious this time of year. Mickey, Pooh, Tigger, and Princesses are among the ornaments on my tree. Pooh clings to a large snowflake as the tree topper. 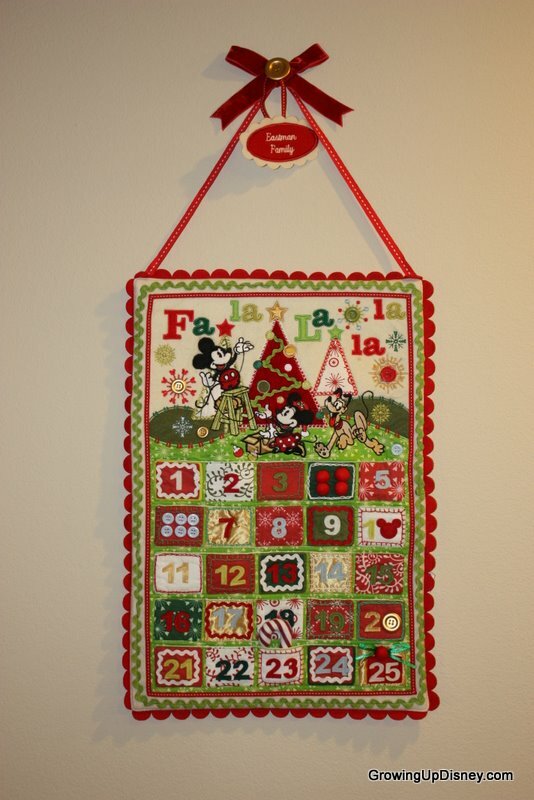 We count down the days until December 25 along with Mickey, Minnie, and Pluto on our advent calendar. 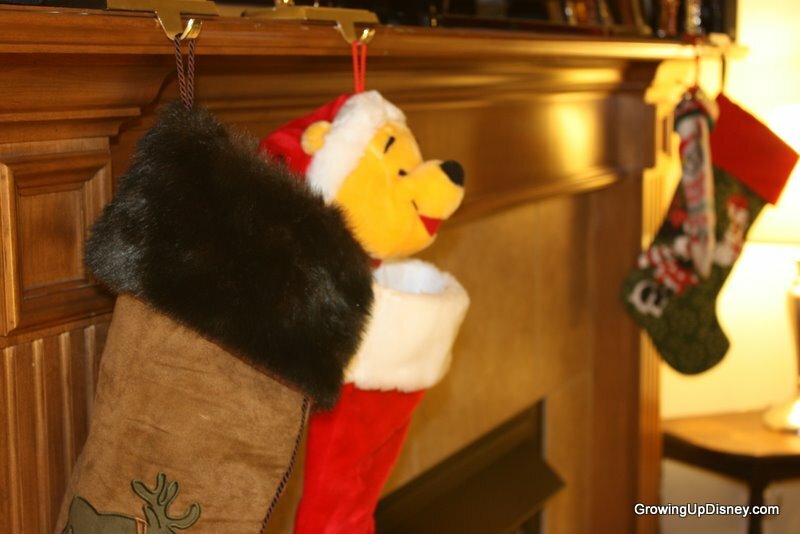 Santa leaves small treats in Pooh and Minnie Mouse stockings on the mantle. Oh, and in a simple moose stocking for my husband. ﻿﻿Cookies are left for Santa on a special Mickey plate. 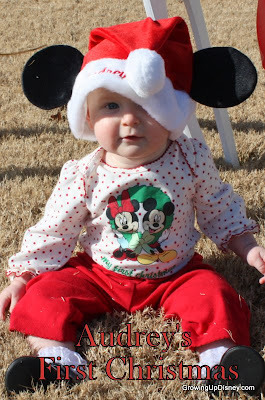 Audrey opened gifts on her first Christmas in her Mickey ear Santa hat while the Disney Parks Christmas Special played in the background. I can see Mickey being added to our outdoor display when Audrey is old enough to add her ideas to the plan. I make sure to wrap gifts for my niece and nephew in Disney paper. My niece tends to get new princess toys from us every Christmas. While we always remember the true reason for the season, it's fun to add a little Disney magic to the celebration. DisneyStore.com is a great place to find gifts for the Disney fan in your life. Once you are on the email list, they'll keep you up to date on their specials. Last year, I combined several offers and saved a lot of money and even got some of my gifts personalised. I also took advantage of the off season clothing clearance and saved even more. Audrey got some really cute dresses and outfits for Spring and Summer. One of the best Disney gifts we've received in the last couple of years was a Mickey and friends waffle maker. My parents got it for Audrey last year and she loves these small waffles. (This is a Disney Store item, but I found it for less on Amazon. They also had this with Princesses and Toy Story characters. Cute! The photo above will link to Amazon for more info.) Disney now sells more park merchandise than ever online, so if you forgot something on your last visit or need a little touch of magic, check there. PARKS: I know my blogorail buddies are going to cover the parks, but let's just say, if you can ever get to Walt Disney World during the time it's decorated for Christmas, it's quite a treat! MERRY CHRISTMAS FROM THE FAMILY BEHIND GROWING UP DISNEY! A gift from a dear friend. The perfect ornament! 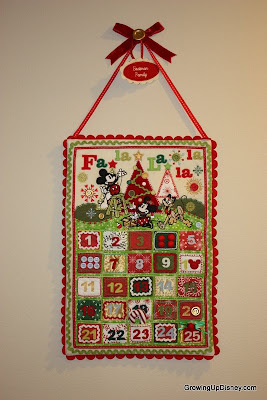 I love our Advent calendar. I love the pictures of Tink on her first Christmas - absolutely adorable! We want to get the waffle iron too, but since my girls love the princesses, all three love Mickey and Toy Story, we just can't decide which to get! Maybe Santa will deliver all 3. 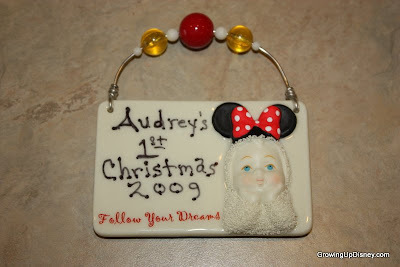 We haven't visited the parks at holiday time yet, but our next trip is planned for December 2011 and I can't wait! I think every picture I've seen of tink just melts my heart, including this one!. Audrey/Tink is such a doll! What a fun Christmas this will be for all of you! I love your Magical Blogorail! Are you open to non-family member posts? If so, Magical Mouse Schoolhouse would love to play too :) Stop by & check it out www.magicalmouseschoolhouse.com, where Disney IS school.